We all break laws. Every day, millions of people jaywalk, download music, and drive above the speed limit. Some laws are obscure, others are inconvenient, and others are just fun to break. Until recently, all but a sliver were illegal, considered infringement under current copyright law. Nearly all were non-commercial, created out of love by fans of the source material, with no negative impact on the market value of the original. This is creativity criminalized, quite possibly the most popular creative act that’s against the law. I don’t think it’s an act of civil disobedience; nobody’s making a statement. Most people don’t know that cover songs need a synchronization license, and even if they did, trying to get one is a confusing and expensive proposition. Unlike the mechanical licenses used to release a cover song on an album, video sync licenses don’t have an affordable flat rate and require the publisher’s explicit permission. Even as YouTube forges agreements with publishers to handle the synchronization rights for cover songs, it’s nearly impossible for musicians to tell whether their songs are covered or not. This week, I set out to answer a seemingly simple question: when are YouTube cover songs legal, and how can we do this better? Even trying to determine if a cover song is legal can be confusing for most musicians. There’s no shortage of answers online, but most of them are conflicting. Publishers, musicians, and lawyers all give different answers, none of which are totally accurate. Even YouTube’s own FAQs are incomplete, made inaccurate by recent settlement agreements. But this answer isn’t fully accurate. YouTube’s negotiated blanket synchronization licenses for its users from thousands of publishers, most notably the settlement with the National Music Publishers Association last August. This agreement allowed publishers to opt-in to a program that let them take a cut from a $4 million advance pool and up to 50 percent of the advertising revenue from any cover song they own the rights to. In reality, the only way to tell whether a song is legal is to risk breaking the law and losing your YouTube account — by uploading the video and waiting for copyright notices. YouTube hasn’t talked much about its melody matching technology, but it was in the news recently after a drunk Edmonton man belted “Bohemian Rhapsody” in the back of a police car. After the Content ID identified the song, EMI initially decided to take the video down, but soon changed its mind and authorized it with advertising. 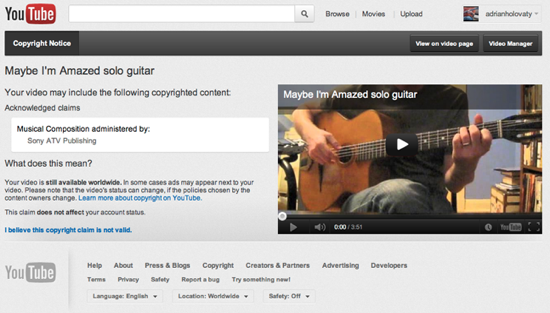 Adrian shared a screenshot of his copyright disputes page. Everyblock founder Adrian Holovaty is well known on YouTube for his acoustic guitar covers, which have amassed millions of views. I asked him if Content ID identified the melodies in any of his videos. So far, seven of his videos were identified, with all but one rights holder choosing to leave the video online and collect the revenue. Only one video his cover of the Village People’s “YMCA,” was taken down by the songwriter, leaving Adrian with a “copyright strike” on his account. YouTube’s policy allows three strikes before the account is terminated and all videos removed. Other copyright claims may be accidental, as material they don’t actually own finds its way into the Content ID database, like this poor guy who’s received eight consecutive claims from companies claiming to own George Romero’s public domain Night of the Living Dead. And Content ID isn’t immune to false positives, like the bird calls misidentified as music. Worse, for all these case, disputed Content ID claims bypass the DMCA process for counter-claims entirely, as I wrote about in February. How can a musician decide what’s legitimate or worth fighting? 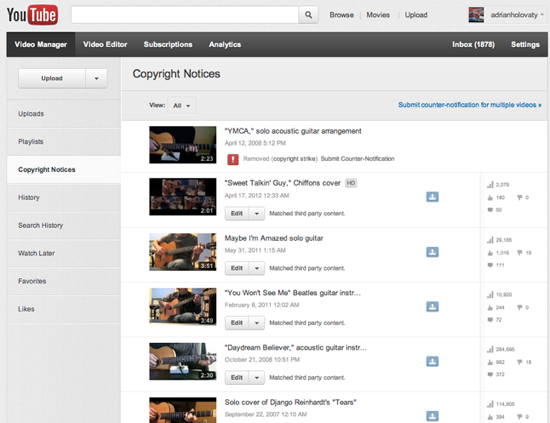 Still, YouTube’s Content ID is pushing publishers and rights holders into the modern age. It’s an ingenious approach for an otherwise dysfunctional copyright system that’s too hard for amateurs to navigate, making money for everyone involved while still allowing free creative expression. But there’s something strange about this begging-for-forgiveness approach to copyright. It’s like driving without traffic signs, only finding out you broke the law when you’re pulled over. The real question: Why is it illegal in the first place? The best solution is the hardest one: To reform copyright law to legalize the distribution of free, non-commercial cover songs. Copyright law was intended to foster creativity by making it safe for creators to exclusively capitalize on their work for a limited period of time. Cover songs on YouTube don’t threaten that ability, and may actually prevent new works by chilling talent that could go on to do great things. As we’ve seen with countless breakout artists from YouTube, budding musicians have built their careers from cover songs that evolved into original material. Karmin, Pomplamoose, Julia Nunes, Greyson Chance…. Even Justin Bieber started with covers of Chris Brown and Nee-Yo before getting discovered. Now, the next generation of budding pop stars are covering Justin Bieber, with about 216,000 of them so far. It’s all part of the virtuous cycle of culture: We take from it, build on it, and then give back in return. The law should help that along, not hinder it. All cover songs are used with permission, with royalties paid to the original songwriters. “80 Ways” is my own composition. Just curious, is it possible to verify this sort of thing? I completely agree – the best solution is to rework copyright law to fit a web-centric world. That is, quite frankly, the only solution that will fairly serve consumers and creators.